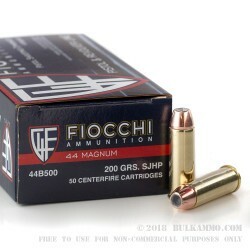 These .44 Magnum rounds from Fiocchi are ideal for self-defense or varmint hunting with revolvers and lever-action rifles. Each cartridge is assembled using excellent components which include non-corrosive Boxer primers fitted to reloadable brass casings and filled with clean-burning propellant. 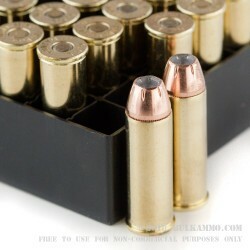 The cases are topped off with semi-jacketed hollowpoint (SJHP) projectiles which weigh in at 200 grains each. 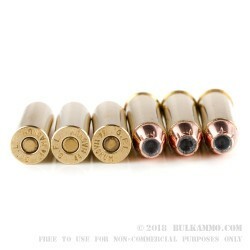 This is a light bullet weight for the .44 Mag caliber and offers a flat trajectory, relatively low recoil, and high velocity without over-penetration in thin-skinned game. The SJHP profile features a hollow cavity of exposed lead with a copper-jacketed base; the combination promotes rapid expansion during entry while the toothed cannelure prevents jacket separation. This results in a round that effectively reaches vital zones and transfers massive amounts of energy in order to yield an efficient stop. 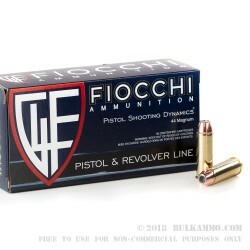 Fiocchi is an Italian company with over 150 years of experience that makes most of its US sold ammo in Missouri.